Cafeteria - Park in parking lot behind worship center. Who are Men of Faith? We are MEN - fathers, sons, brothers, friends - who believe that Jesus is the Son of God. WE are MEN who meet to grow stronger in our Faith. We study God's Word, we pray, we serve in Christ's church to make a difference in God's in our homes, community, and God's world! We are MEN of Faith. All MEN are welcome! Our Men's Breakfast "usually" meets the 3rd Saturday each month from September to May. Join us for our next Men of Faith Breakfast , beginning with a great hot breakfast buffet (Catered by A Tasty Touch) at a low cost of only $5/person, starting at 7:30am! We hope you can join us! 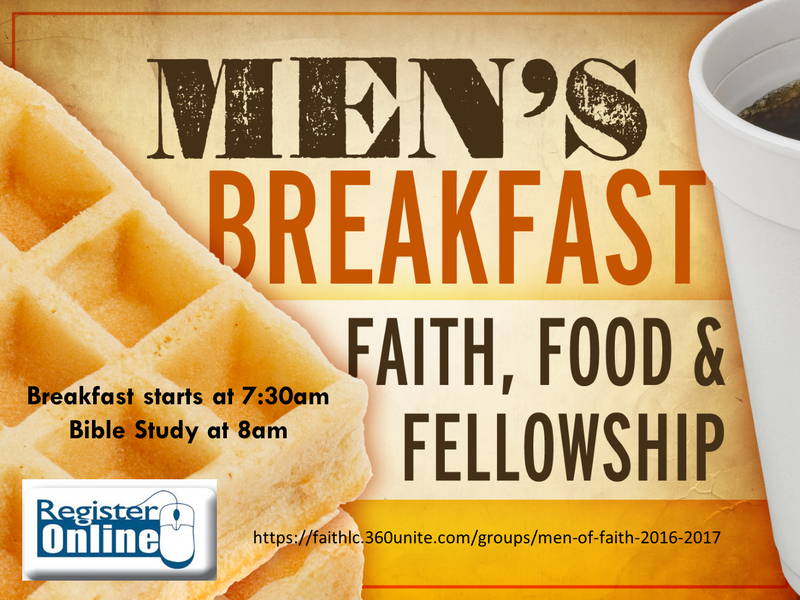 Join us the third Saturday, @ 7:30am for our MEN of Faith Bible Breakfast. Here is the link to register: Register today!